Open Hands and Dirty Feet: Who Doesn't like Public Mineral Baths? "Good afternoon, Ecuador blog enthusiasts. As mentioned in previous posts, the house has been pretty crowded for the past few weeks, and will remain that way for five more weeks, upon which the new set of 2010-2011 Program Directors arrive to this beautiful country. In other words, there will be no more alone time for the current PDs. Not to worry, the new bunch is amazing, and took their first excursion this past weekend to Baños, a touristy city located just under the shadow of a very active Volcán Tungarahua. Many PDs joined the group on their trip, and had a blast hanging out with the newbies. (An interesting side-note: my mom informed me that she actually met one of her best friends in Baños, sitting in the main plaza, in the 1970’s when she was traveling around South America. It was a small enough town back then that two Gringas could actually stand out in a crowd of Ecuadorians and bond over their foreignness). 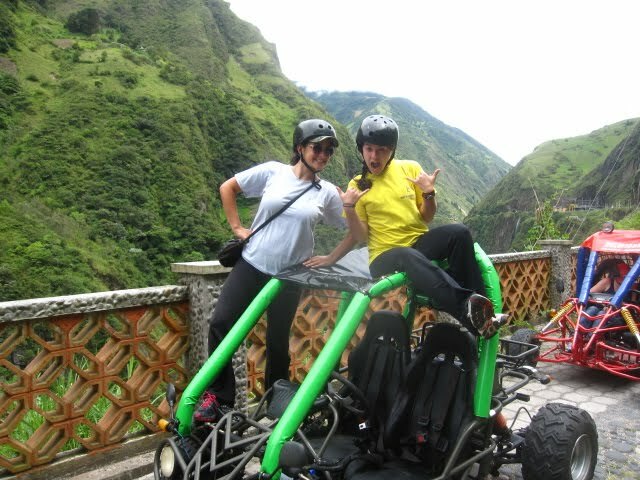 Baños is jam-packed with activities, and a two-day trip was barely enough to sate our adventurous appetites. 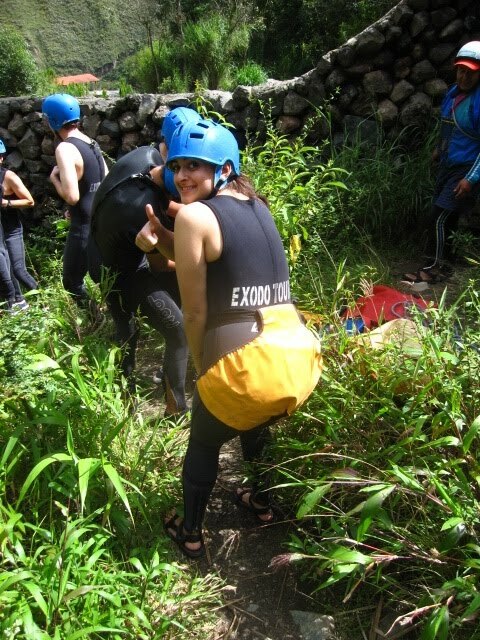 We participated in canyoning (rappelling down waterfalls, basically), bike riding, go-carting, four-wheeling, mineral baths, massages, party-busing, discoteca dancing, sun-burning, sleeping in, and bonding. It was a legendary (for lack of a better word and yet another “How I Met Your Mother” reference) weekend, and here are some pictures to keep you entertained and amused. On a personal note, this IS the guest blog of one Shawn Fagan, and therefore I would like to take the time to address those readers who have been following my blog posts and are deeply concerned with the progress of the recreation of my Brooklyn movie collection in bootleg Ecuadorian DVDs. It has not been an easy task. Most video stores here compete to be the first with the most brand-spanking-new movies possible, and therefore having a classic collection is less than a priority. Mike and I have so relentlessly bothered our favorite DVD lady that today I finally encountered and purchased the first season of “Mad Men," a series virtually unknown in this country. Kevin Smith will have to wait for his time.